Maryam Rofougaran is a transformational inventor, technology executive, and entrepreneur in the field of electrical engineering, with a focus on wireless technologies. She was co-founder of Innovent Systems in 1998, and has been listed on the National Diversity Council’s Top 50 Most Powerful Women in Technology. 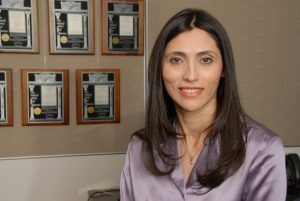 Maryam was instrumental in starting and building the wireless business at Broadcom and in growing it to annual revenues of more than $3 billion. Maryam has 245 (two hundred and forty-five) issued U.S. patents and 66 pending U.S. patent applications, has authored and co-authored more than 40 journal and conference papers, and is a senior member of the IEEE circuits and systems group. She completed her high school education at Behesht Aeen High School in Isfahan and holds undergraduate and M.S degrees in electrical engineering from the University of California, Los Angeles. To the extent that I have had “success” in my field, I attribute it to my love for math and physics from an early age and the fact that I have always enjoyed solving challenging problems. Hard work and perseverance have been other factors. In addition to these, the encouragement and continuous support of my family throughout — especially my brother Reza who lived in the USA and was in the same field during my university years — were important in giving me the confidence to continue to the next levels. They all believed in my talent and capabilities, and kept encouraging me throughout my studies and career. My husband has also been a major source of support for my career and has been a partner in taking care of our children so that I can perform the multiple tasks of being a businesswoman and a mother. You have been listed on the National Diversity Council’s Top 50 Most Powerful Women in Technology, which also includes pioneering women from Facebook, Google, Yahoo!, Apple, Salesforce, Netflix, Comcast, General Electric, IBM, Texas Instruments and more. What are your most significant accomplishments that brought you to this point? Perhaps it’s my long-term track record as an engineer who started as a graduate student as part of a very small team, which included my brother Reza as my coach. Our team was given the chance to work on new and challenging projects at UCLA’s department of electrical engineering. At UCLA, we implemented high frequency radio transceivers through a cheap Complementary Metal Oxide Silicon (CMOS) process. Prior to our work, CMOS was mainly used for implementation of digital circuits and baseband chips that contained mostly digital blocks. We managed to implement a complete high frequency radio transceiver “900Mhz spread spectrum radio” in the CMOS process and integrated it with the baseband on the same microchip. You and your brother Reza are best known for the invention of combo chips that merge different technologies onto tiny pieces of silicon. According to Professor Frank Chang of the electrical engineering department at UCLA, your work has “revolutionized” wireless technology by integrating an unprecedented number of functions on a single chip. Could you tell us about your invention, what it is, and how you came up with the idea? We used the CMOS process to implement wireless chips in our wireless startup, Innovent Systems. After we were acquired by Broadcom in 2000, we continued to use the CMOS process in Broadcom’s microchips such as Bluetooth, WLAN, GPS, etc. After a few years, we wanted to come up with a new and smarter idea to further reduce the size and cost of the products. This is when we decided to find techniques to integrate multiple wireless standard chips onto one microchip. Basically, we decided to put our Bluetooth, WLAN, and FM radios all on one silicon using the cheap CMOS process. This was challenging because there were many different Giga Hertz high frequency blocks from these radios that could interfere with each other when placed side by side on a very tiny microchip. We were the first to show that this integration is possible, and for a long time our competitors were struggling to make the same product with the high performance that we were achieving. This gave us a big lift in our market share and ensured our leadership in the market. In the long term, wireless will become the cheapest and easiest mode of communication because it does not involve expensive and lengthy infrastructure investments such as putting cables or fibers underground. Future wireless communication systems will offer much faster data rates in the hundreds of gigabits range, and will utilize and combine different communication nodes such as satellite, base stations, small cells, etc., to connect the entire earth. Smart cars will be connected wirelessly and will use new wireless capabilities. In the future, wireless communications will play an even larger role in people’s lives than they do today, improving capacity at home, work, hospitals, and remote areas, and enabling many new applications that have yet to be conceived.